Turmeric is a root that looks similar to ginger. It is powdered before use and taken in food, capsules, tinctures, and tea. The health benefits of turmeric have been known for centuries in India, Asia, the Caribbean, and the Middle East where it has a long history of use as both a culinary spice and a medicine. Turmeric is cholesterol-free and very low in calories (only 24 calories in 1 Tablespoon of dried turmeric). 1. Studies show that turmeric may help prevent and slow the progression of Alzheimer’s disease by removing plaque buildup in the brain. 2. Turmeric is highly anti-inflammatory, equal to many anti-inflammatory drugs, but without the side effects. Maybe drinking turmeric tea can help ease daily aches and pains, as well as the pain from working out? 3. Turmeric has anti-cancer properties. 4. Turmeric has natural anti-septic and anti-bacterial properties, making turmeric tea a wash that can prevent cuts and burns from getting infected. 5. Turmeric is a natural liver detoxifier. Since Traditional Chinese Medicine believes the liver is the seat of anger, perhaps a cup of turmeric tea a day can keep anger away. 6. Studies show turmeric may help slow the progression of multiple sclerosis. 7. Turmeric is a natural painkiller. The next time you reach for aspirin, you might want to brew a cup of beneficial turmeric tea instead. 8. Turmeric’s anti-inflammatory properties show it may be a natural treatment for arthritis and rheumatoid arthritis. 9. Traditional Chinese Medicine considers one of the many health benefits of turmeric to be that it is a natural anti-depressant. 10. Turmeric tea may help with fat metabolism and weight loss. 11. Turmeric tea benefits upset stomachs and nausea. 12. Turmeric may help speed up recovery from coughs, cold, and the flu. Turmeric’s anti-inflammatory properties have made it highly beneficial for various skin elements, including psoriasis and rosacea. My mother has seen positive benefits treating rosacea with Psoria-Gold (not an affiliate link), which contains turmeric-derived extracts. Turmeric may also help repair damaged skin and speed up wound healing. Dried turmeric is a natural yellow dye that is activated when it becomes moist. Be careful about not getting turmeric on your clothes, paper, and other porous items. Turmeric will not wash out. With that said, turmeric tea does make a great natural Easter egg dye! Turmeric tea side effects occur most often when large quantities of turmeric tea are drank. Diarrhea is a common side effect when too much turmeric tea is consumed. If you have hemophelia, you may want to avoid turmeric because it can thin the blood. Turmeric can lower blood pressure which may cause side effects for those on high blood pressure medication. 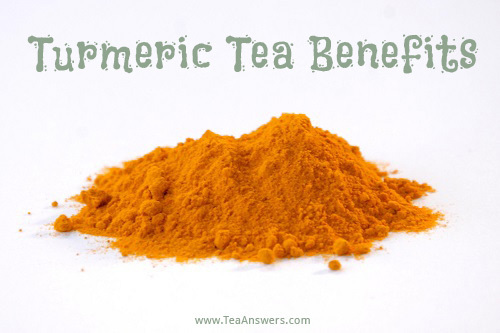 Turmeric tea may also interfere with prescription medication. If you are pregnant, have high blood pressure, have gallbladder issues, hemophelia, or are on prescription medication, please consult with your healthcare provider before consuming turmeric tea. If you have any other health issues, concerns or questions, please consult with your healthcare provider before taking turmeric.